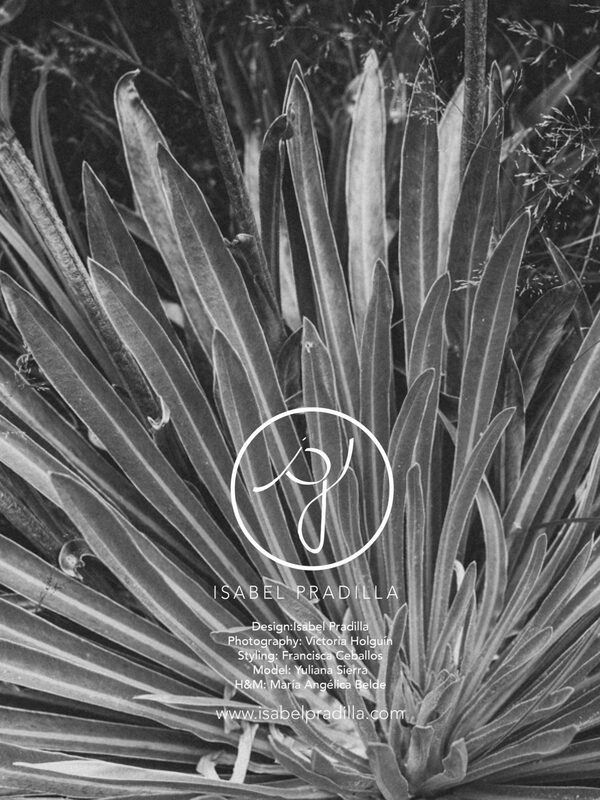 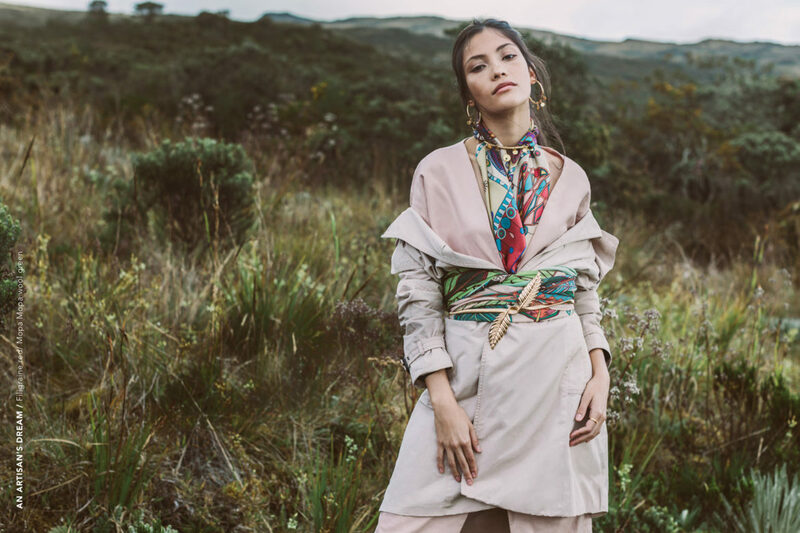 Kosmos I is the first part of a larger collection inspired by Alexander von Humboldt’s fascinating travels around Russia and the Americas in the early 19th century. 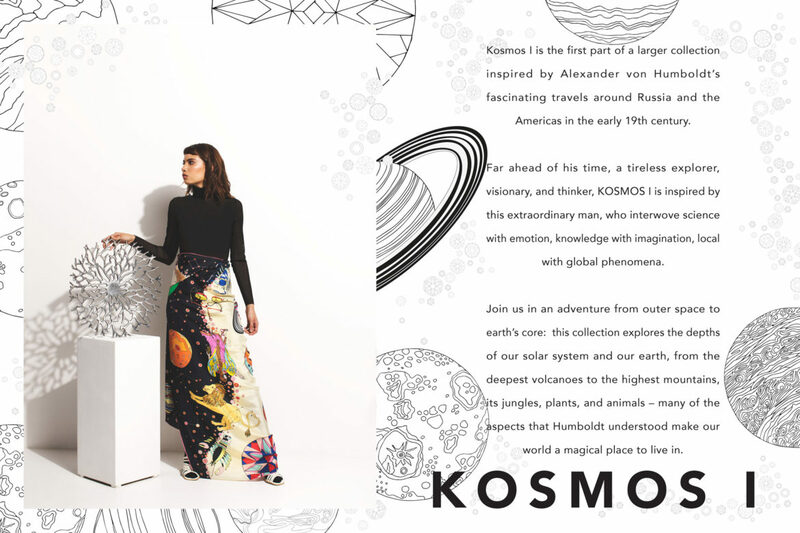 Far ahead of his time, a tireless explorer, visionary, and thinker, KOSMOS I is inspired by this extraordinary man, who interwove science with emotion, knowledge with imagination, local with global phenomena. 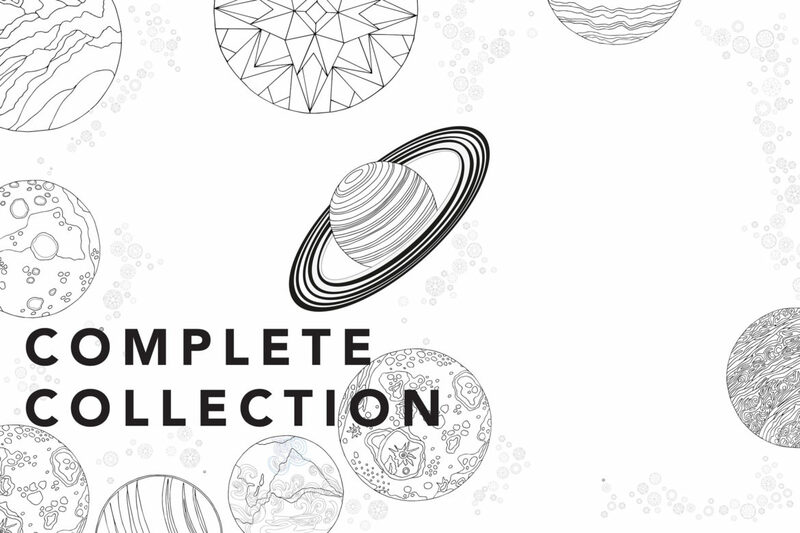 Join us in an adventure from outer space to earth’s core: this collection explores the depths of our solar system and our earth, from the deepest volcanoes to the highest mountains, its jungles, plants, and animals – many of the aspects that Humboldt understood make our world a magical place to live in. 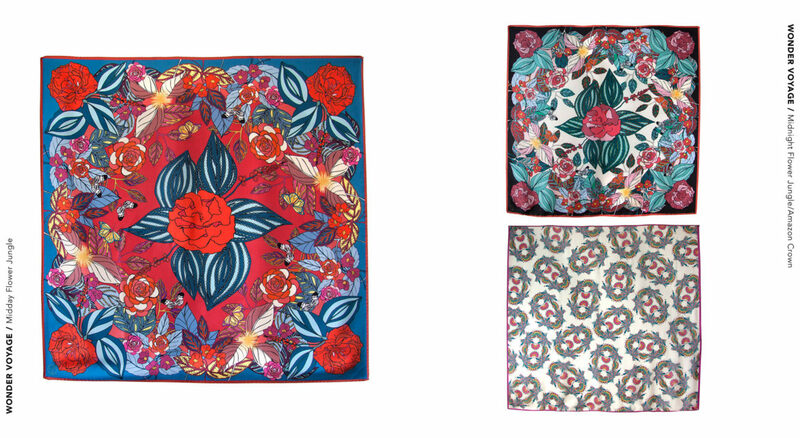 All scarves are available to buy. 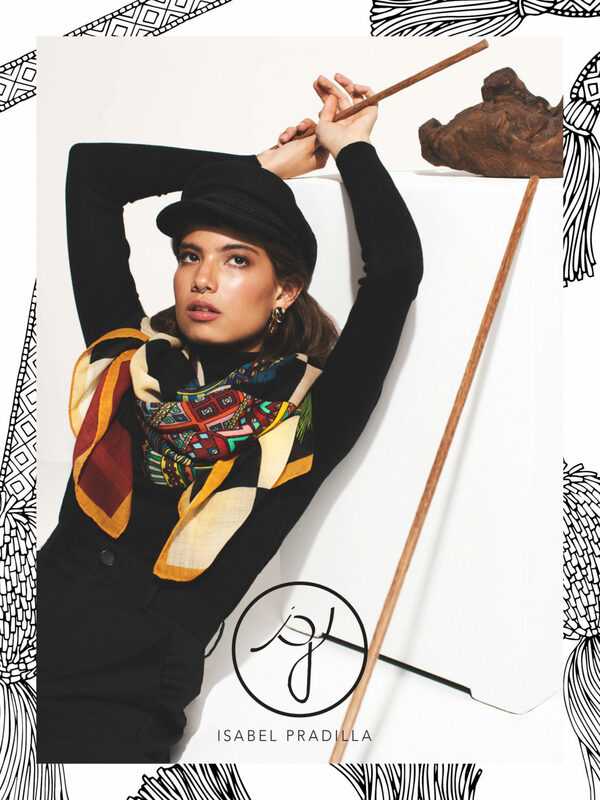 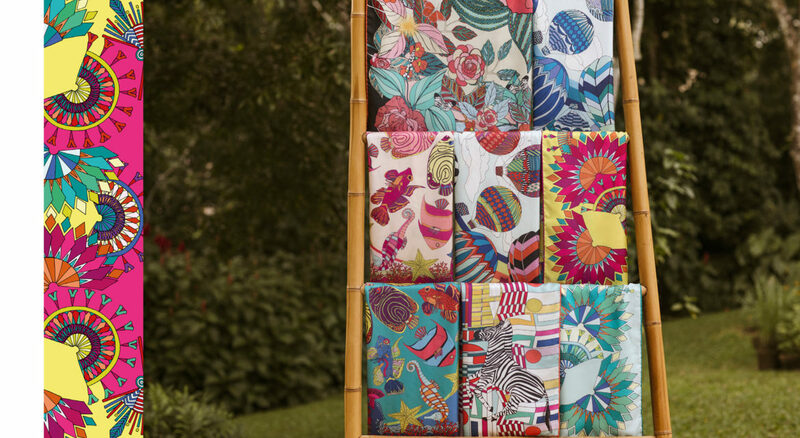 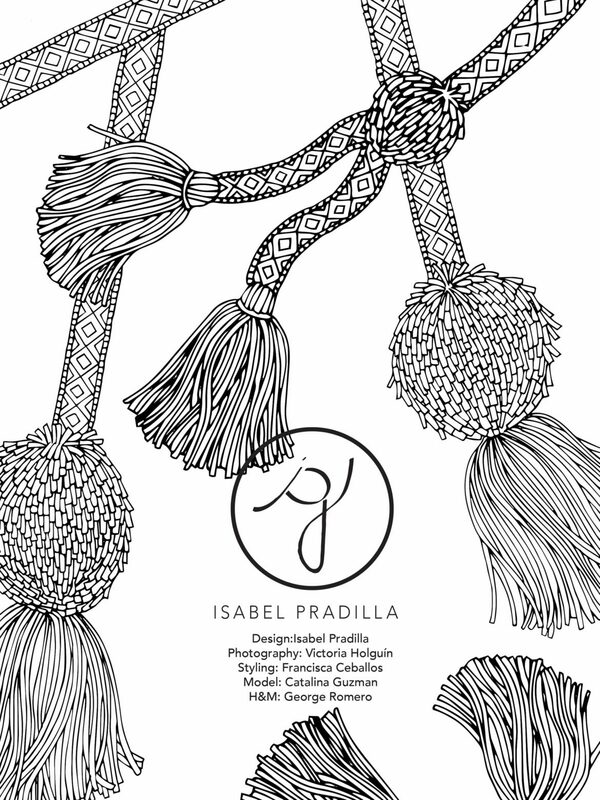 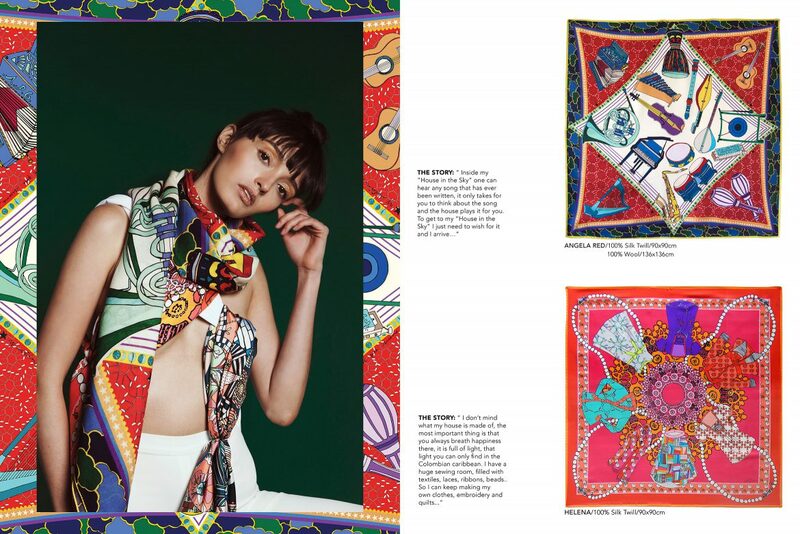 From San Juan de Pasto to Singapore, “An Artisan’s Dream” is inspired by the beauty and diversity of handicrafts found in all cultures around the world. 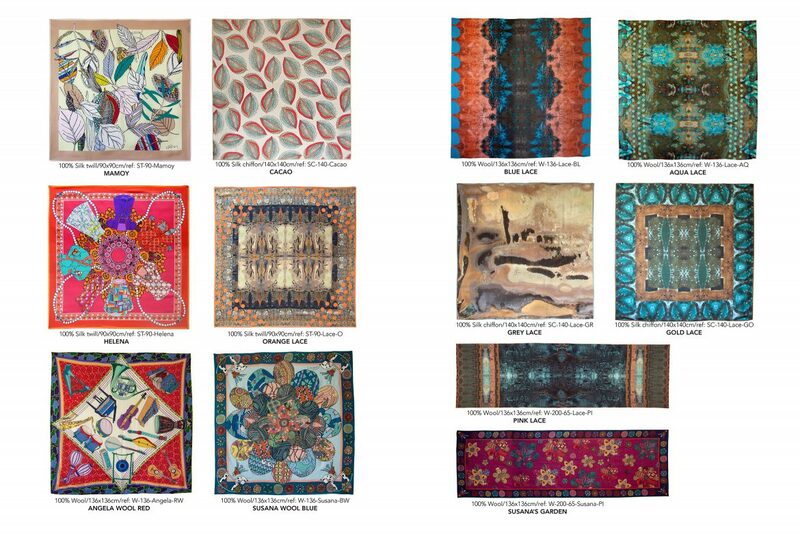 Elaborate ceramics, intricate textiles, ancient inlay techniques, and many other unique artistic expressions are the starting point for our “An Artisan’s Dream” collection. 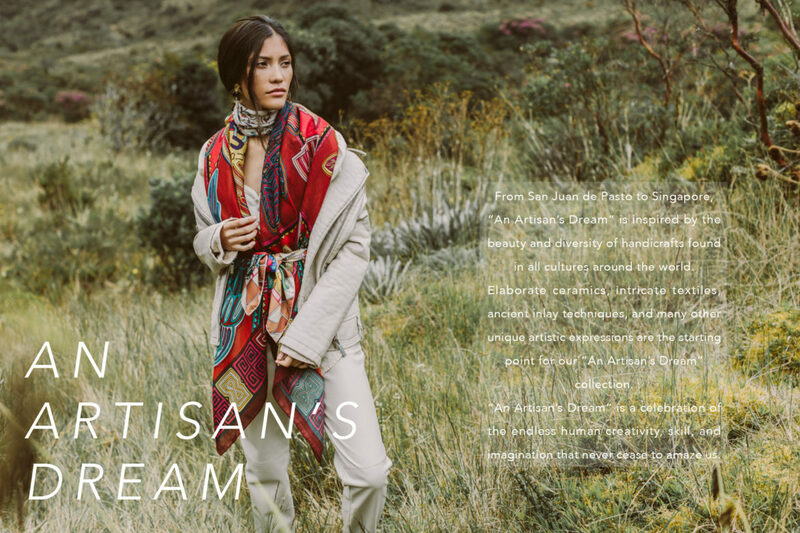 “An Artisan’s Dream” is a celebration of the endless human creativity, skill, and imagination that never cease to amaze us. 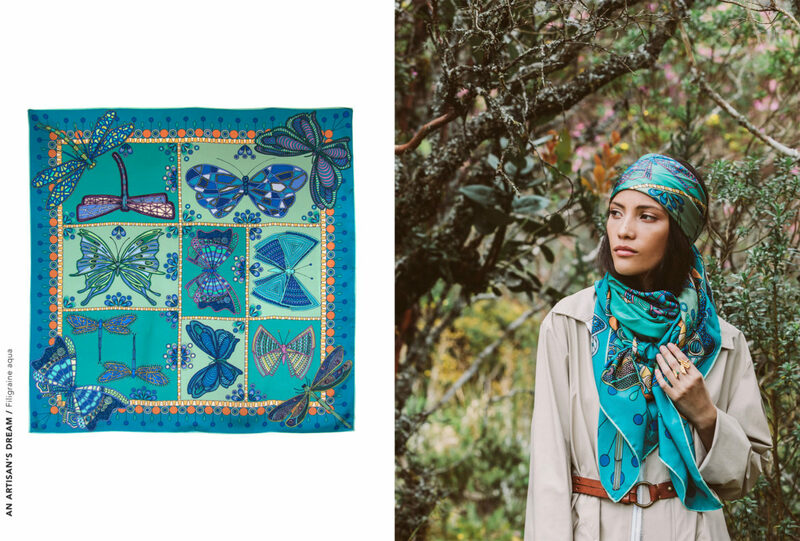 “Wonder Voyage” is inspired by imaginary travels to fantasy destinations found in our dreams, our imagination, and inside the pages of books. 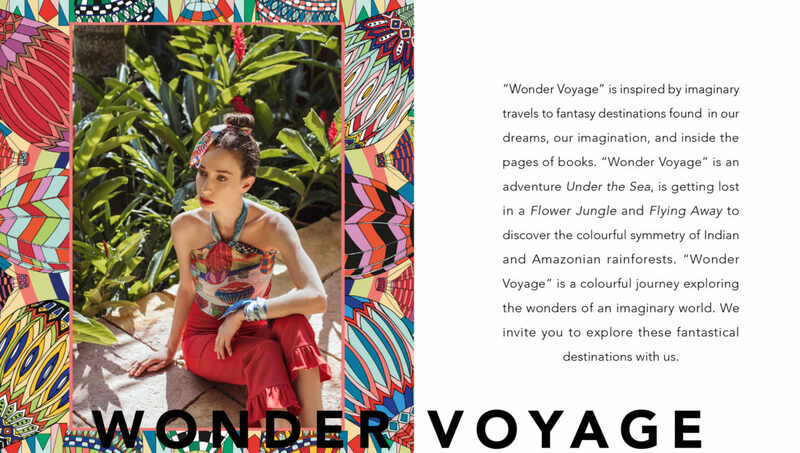 “Wonder Voyage” is an adventure Under the Sea, is getting lost in a Flower Jungle and Flying Away to discover the colourful symmetry of Indian and Amazonian rainforests. 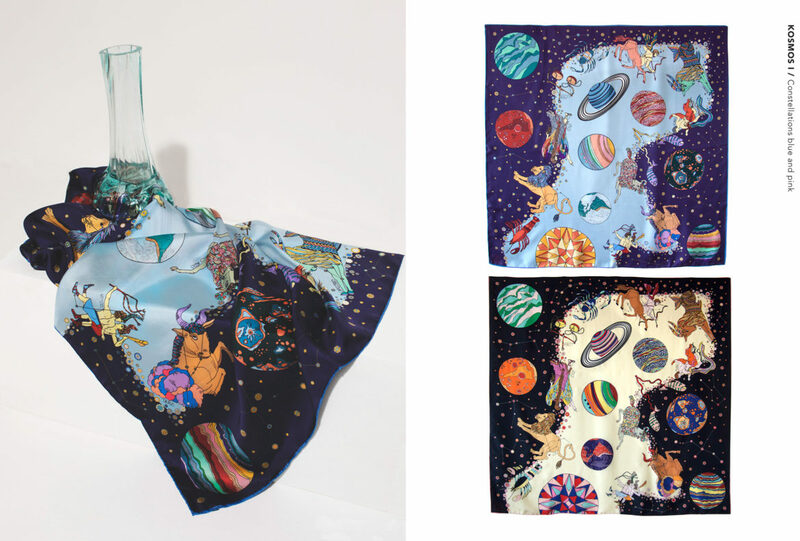 “Wonder Voyage” is a colourful journey exploring the wonders of an imaginary world. 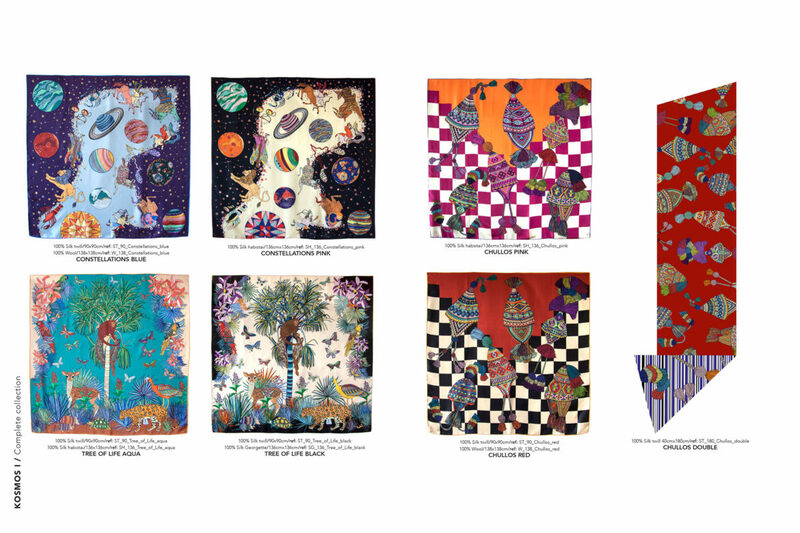 We invite you to explore these fantastical destinations with us. 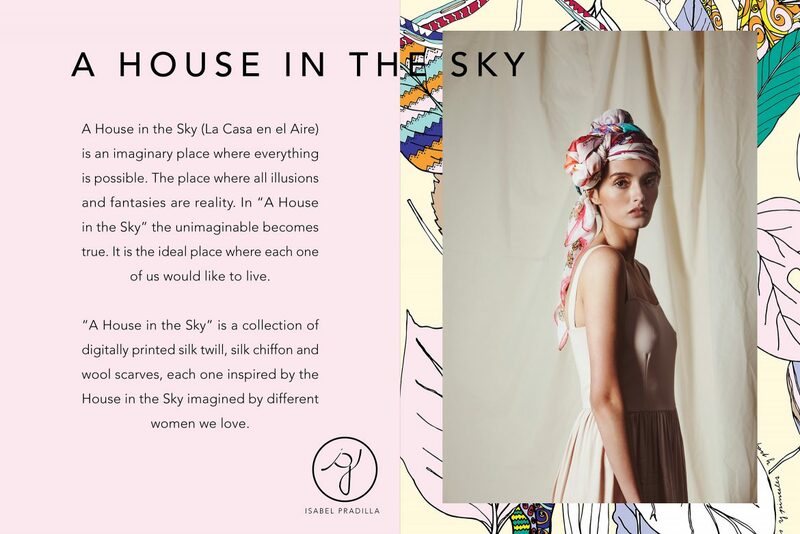 A House in the Sky (La Casa en el Aire) is an imaginary place where everything is possible. 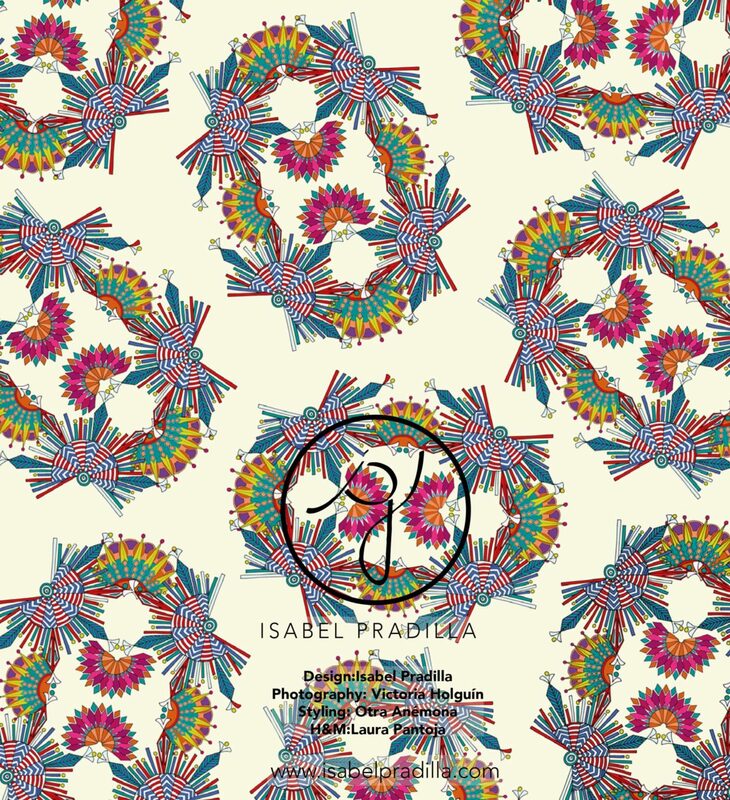 The place where all illusions and fantasies are reality. 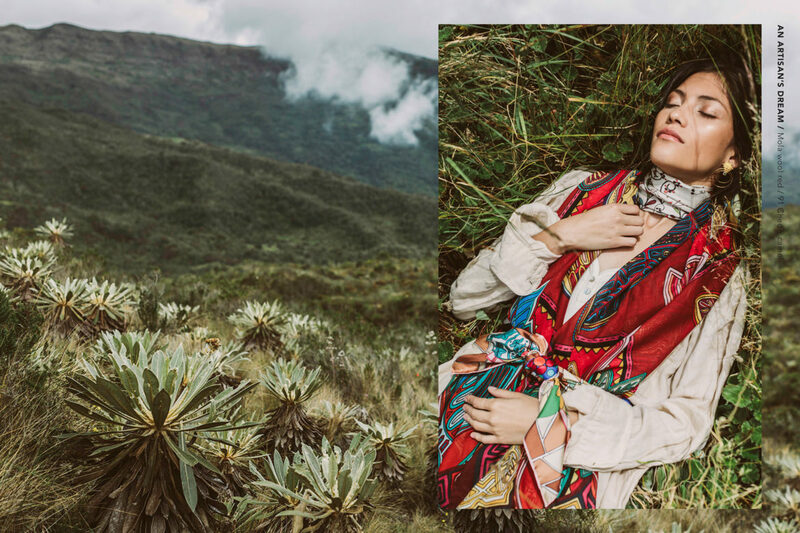 In “A House in the Sky” the unimaginable becomes true. 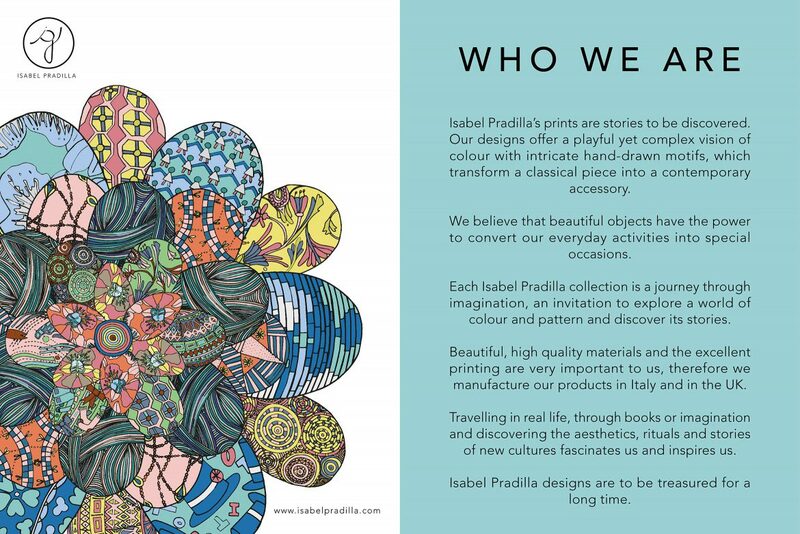 It is the ideal place where each one of us would like to live. 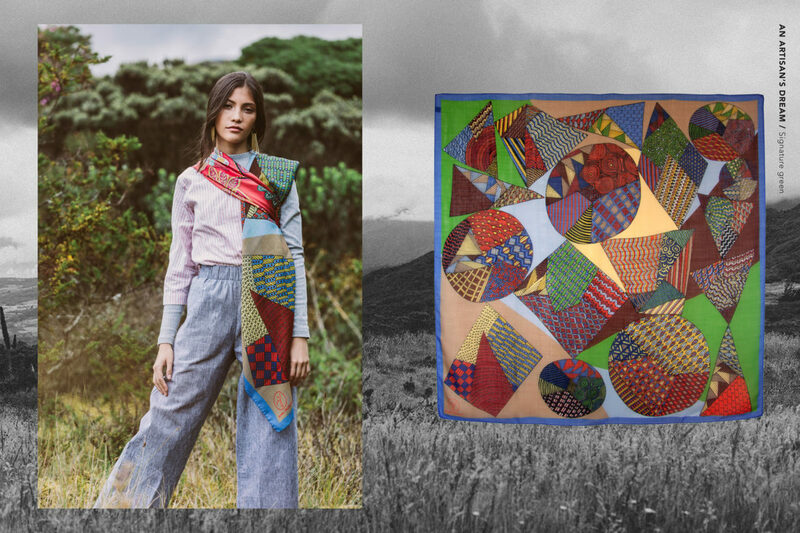 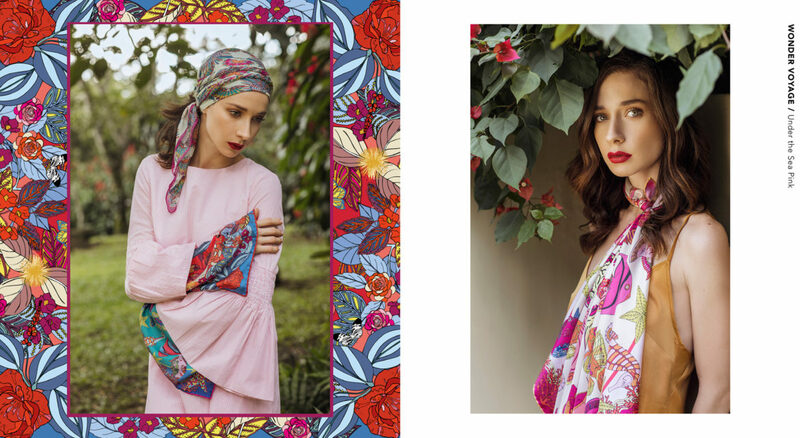 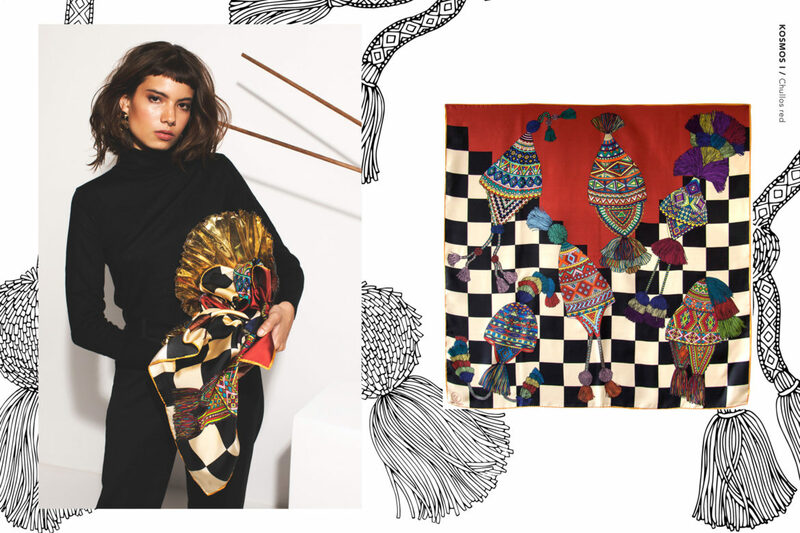 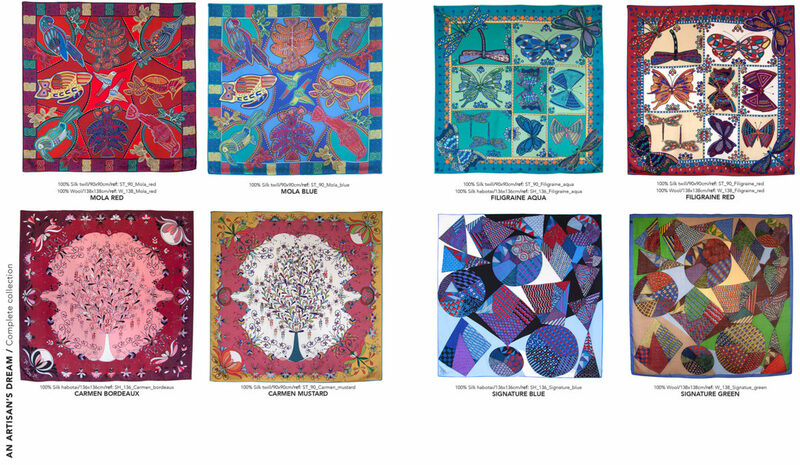 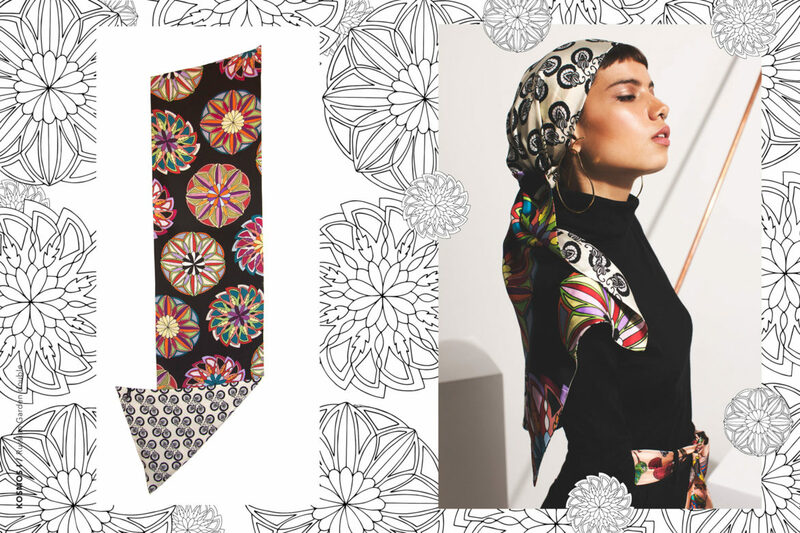 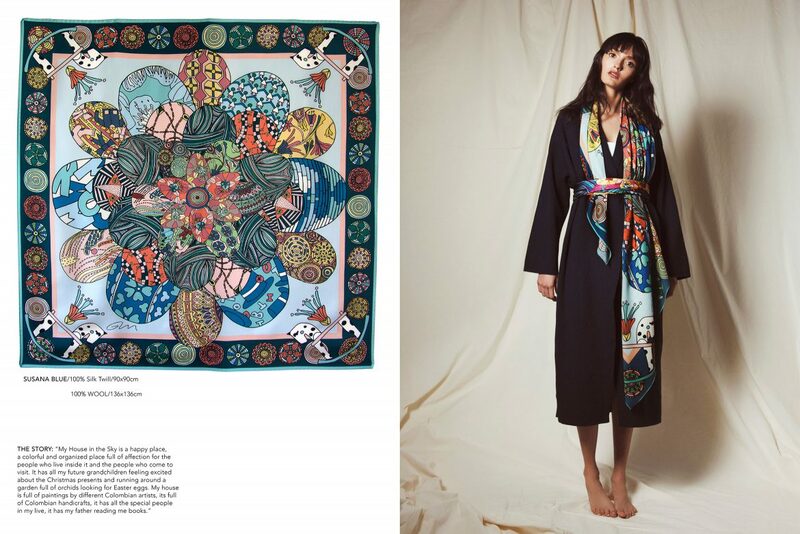 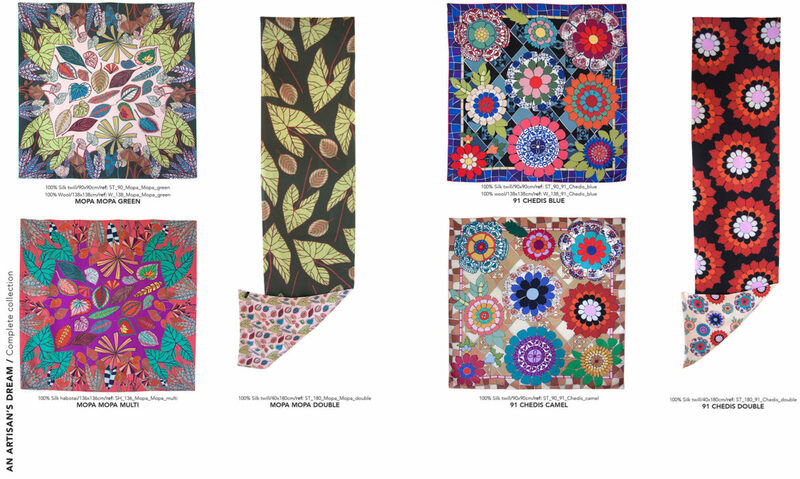 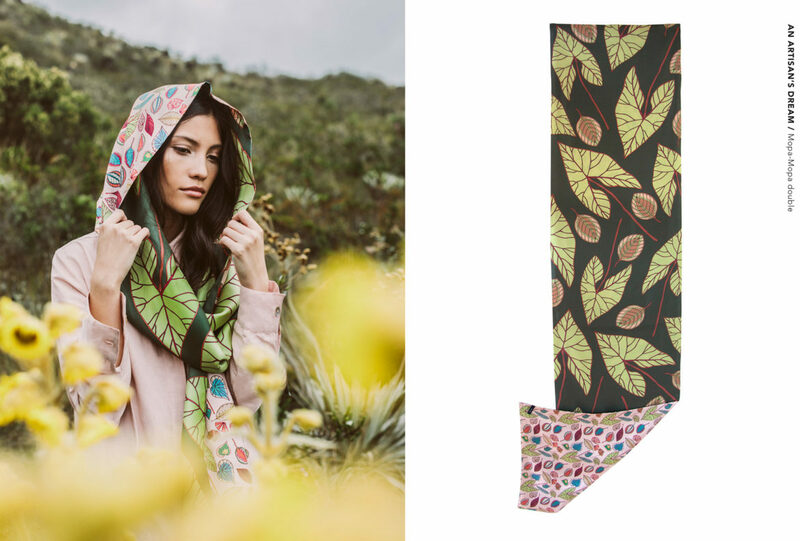 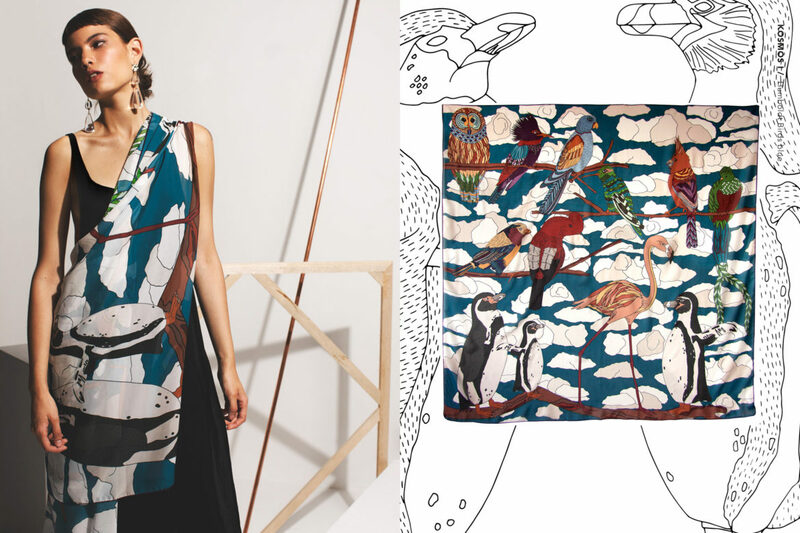 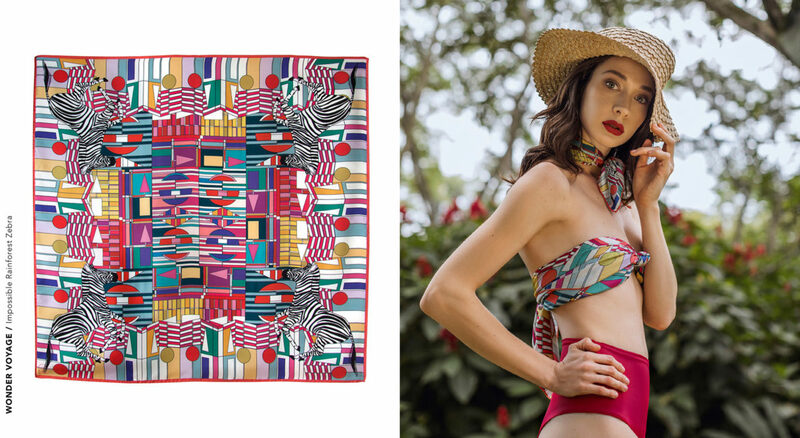 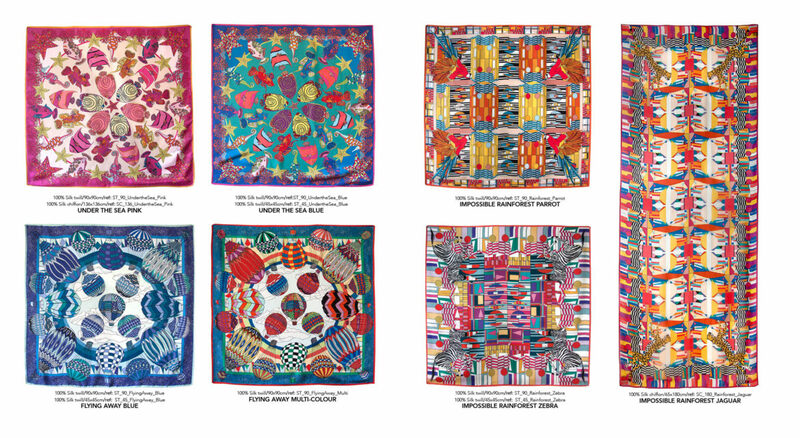 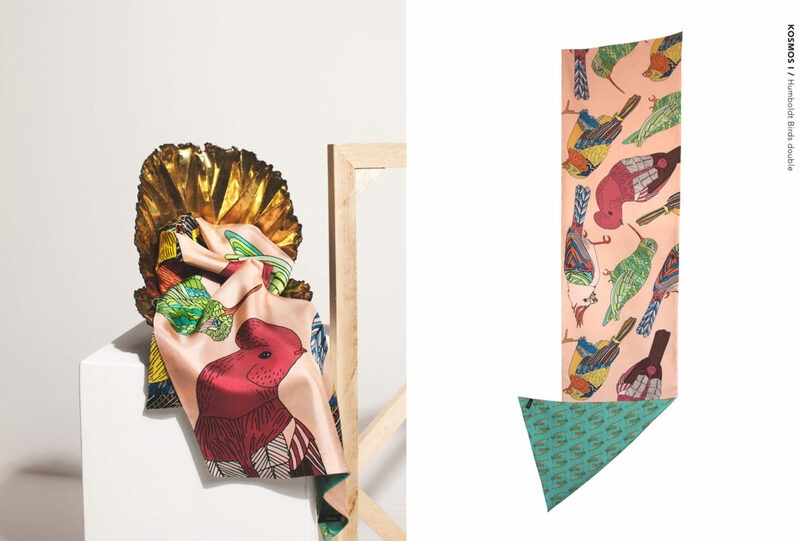 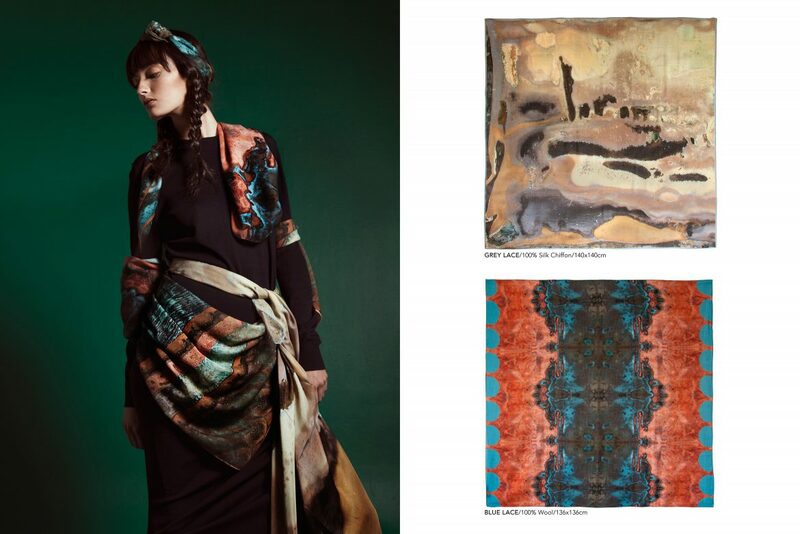 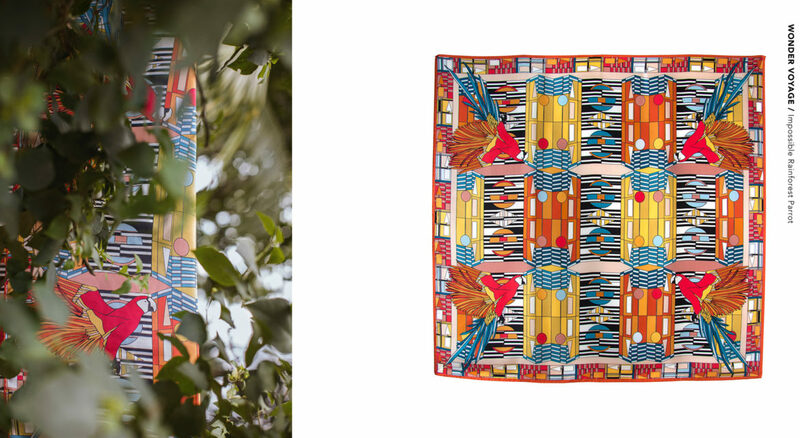 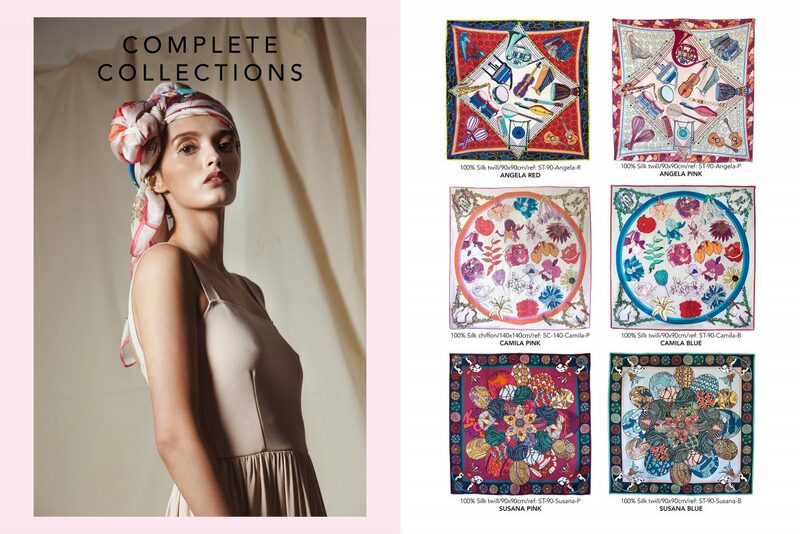 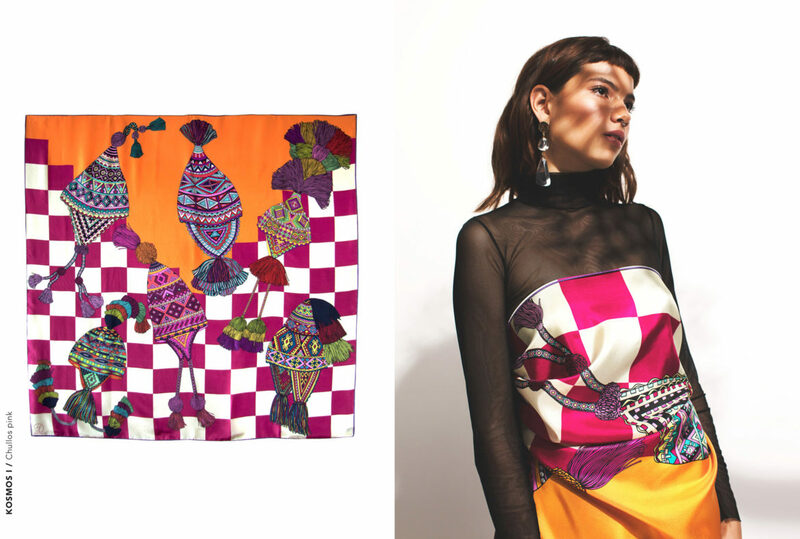 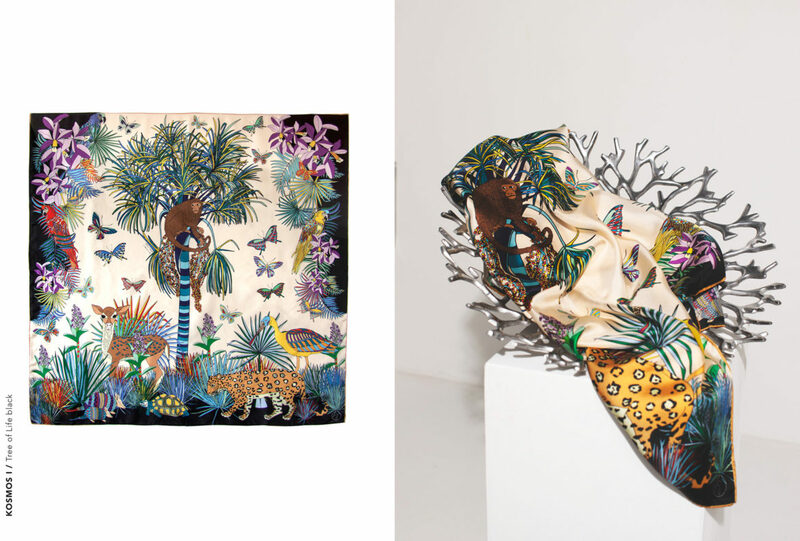 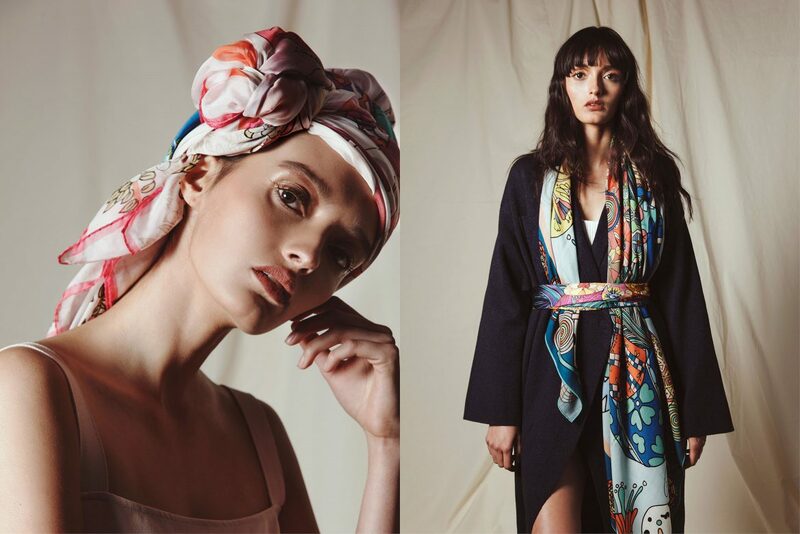 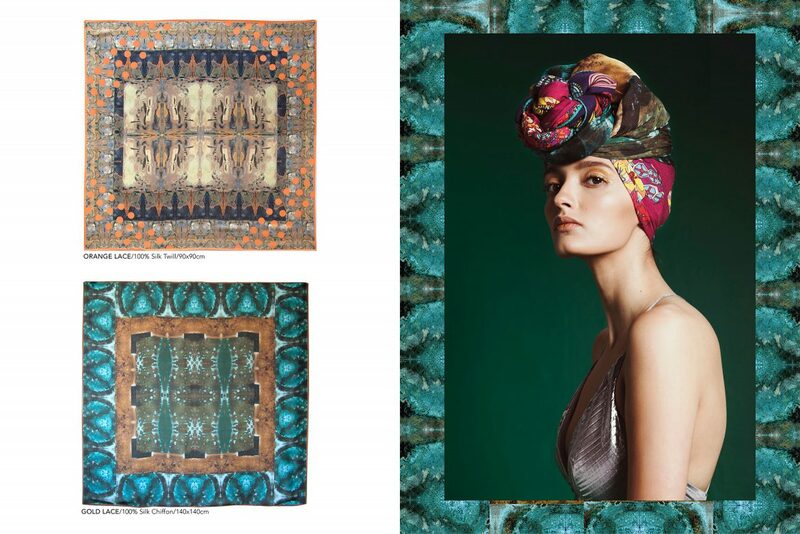 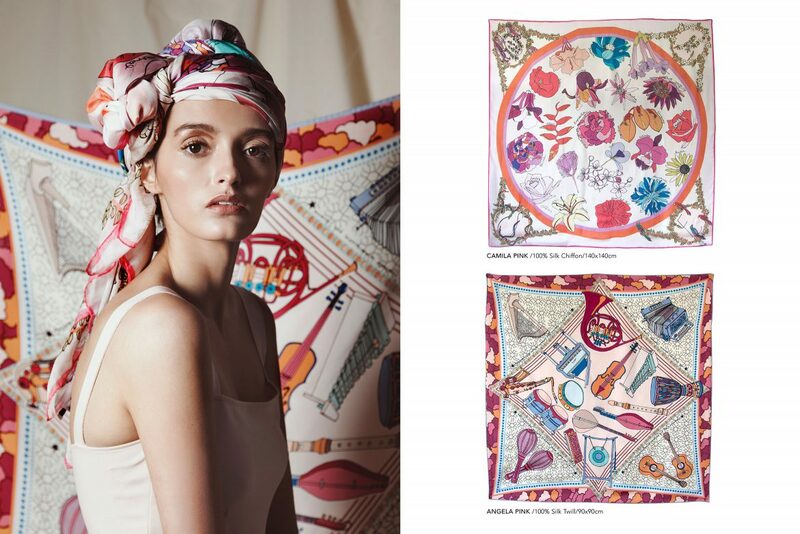 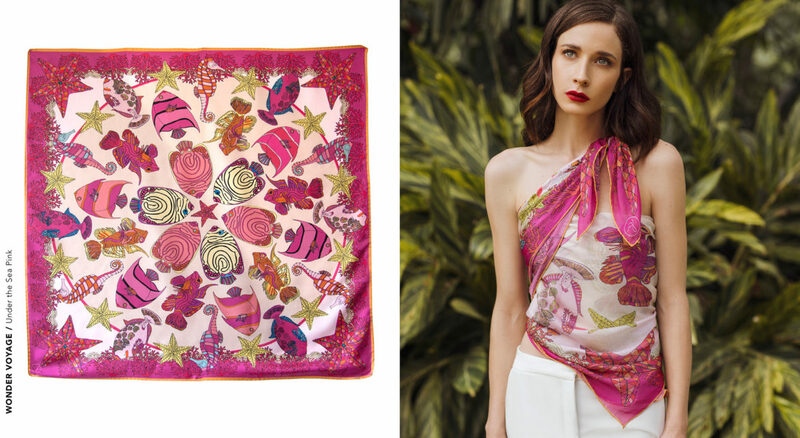 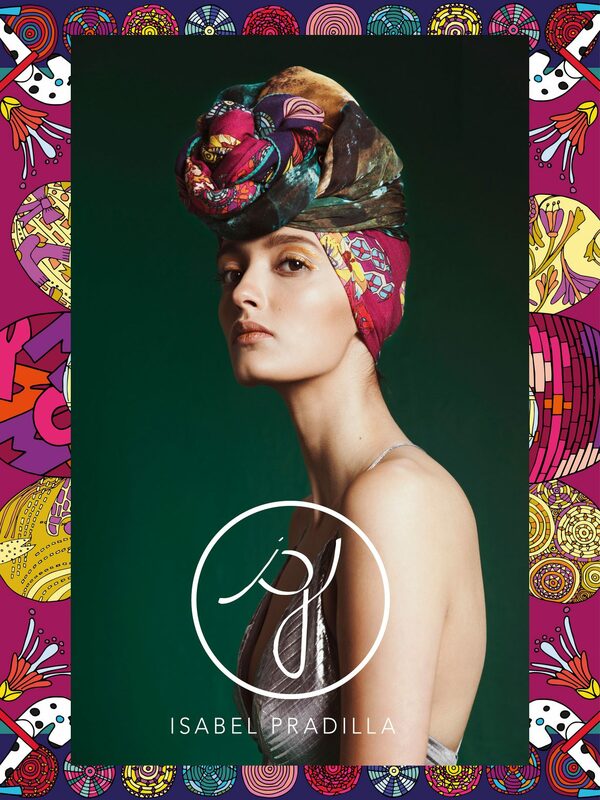 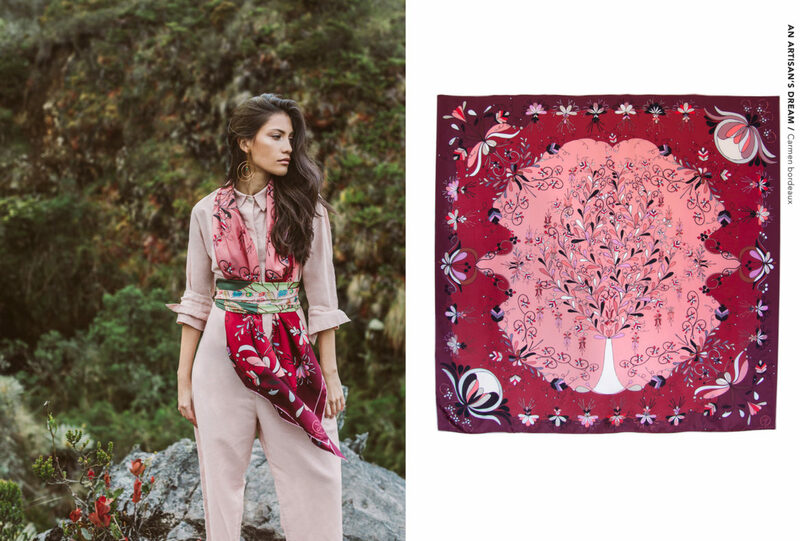 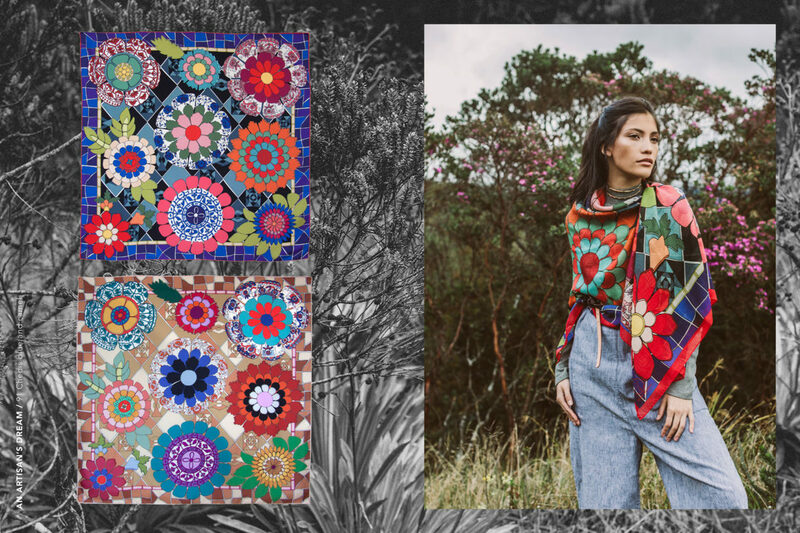 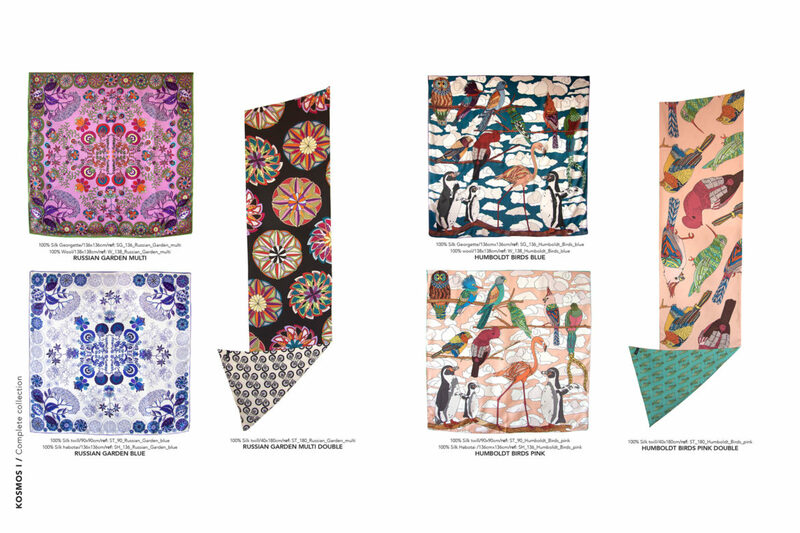 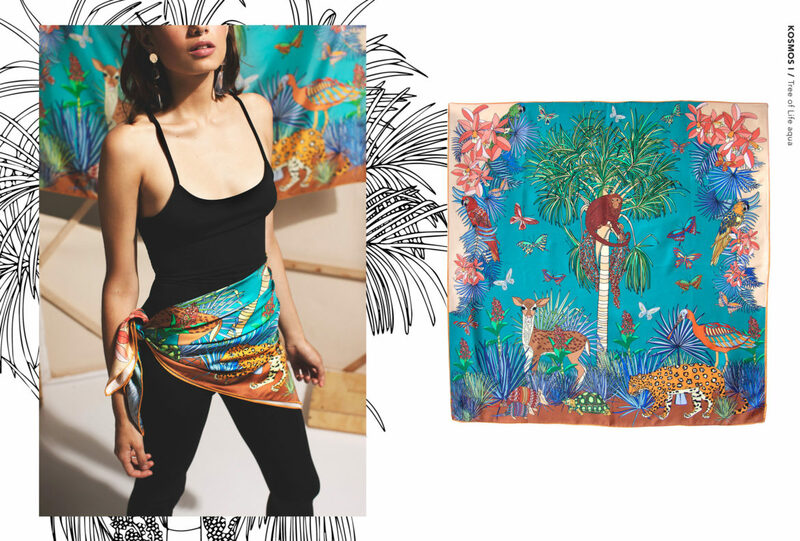 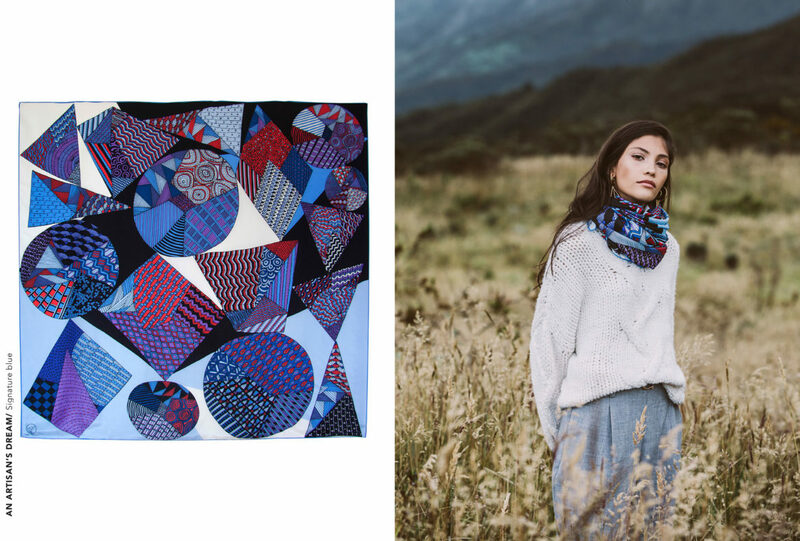 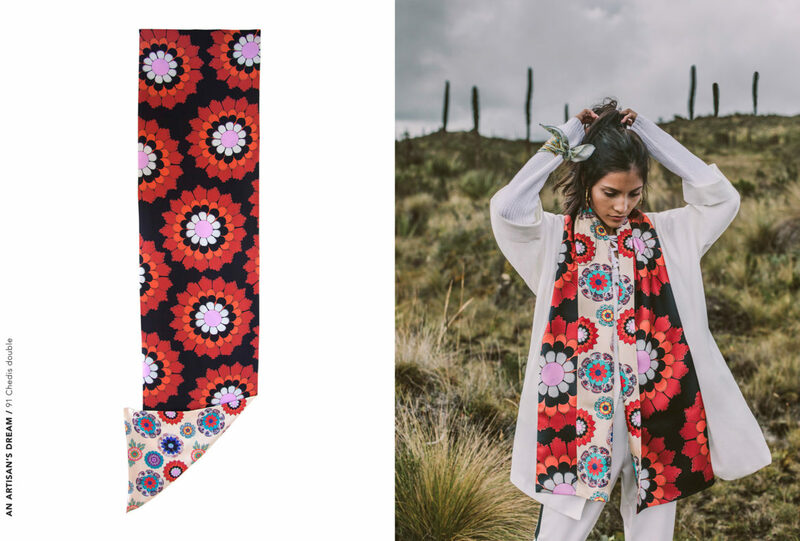 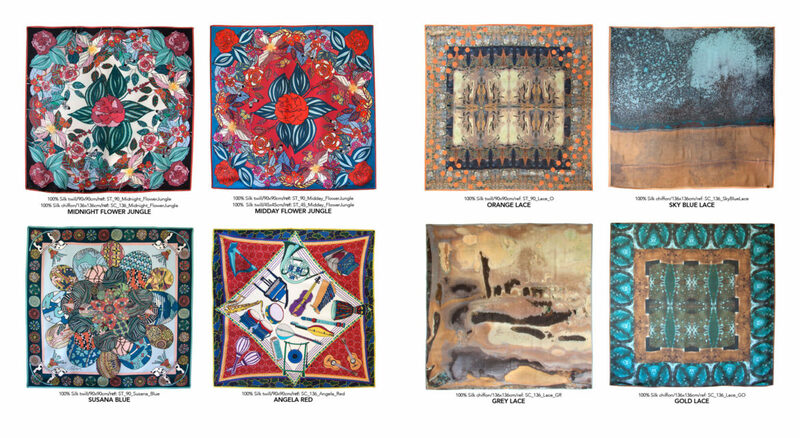 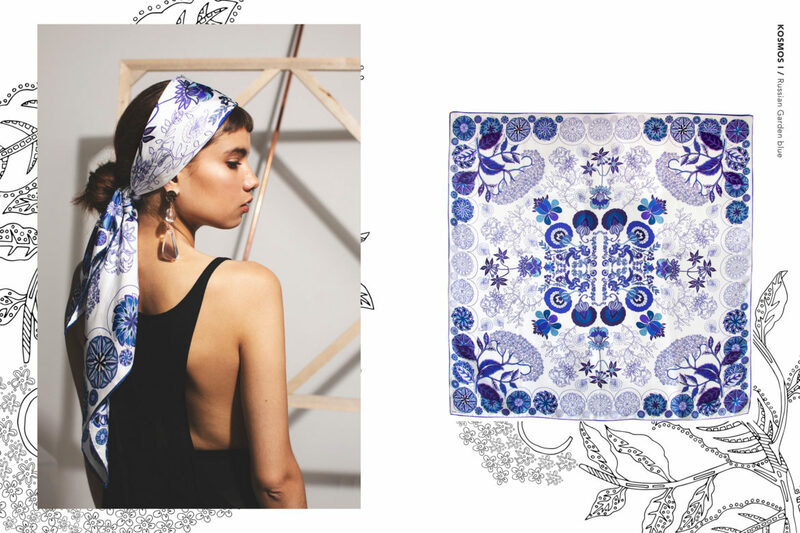 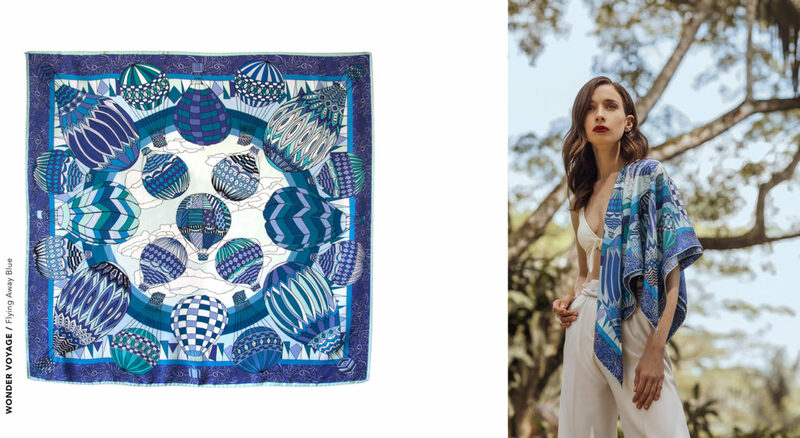 “A House in the Sky” is a collection of digitally printed silk twill, silk chiffon and wool scarves, each one inspired by the House in the Sky imagined by different women we love. 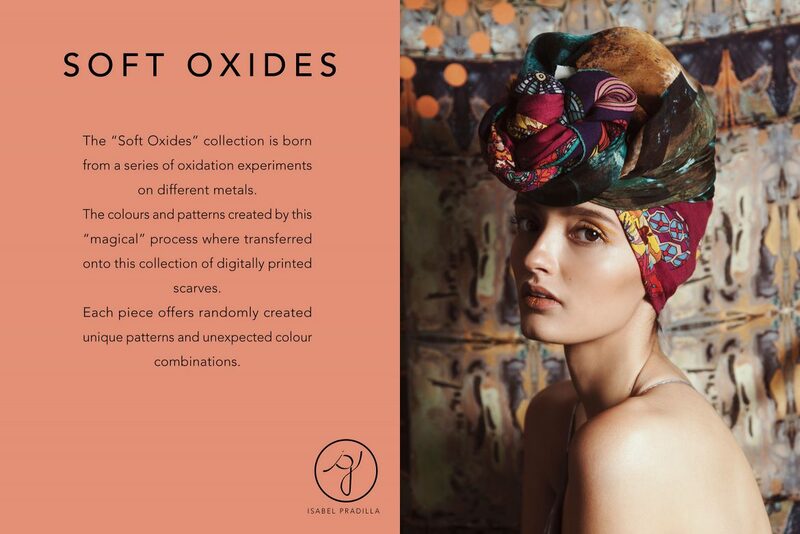 The “Soft Oxides” collection is born from a series of oxidation experiments on different metals. 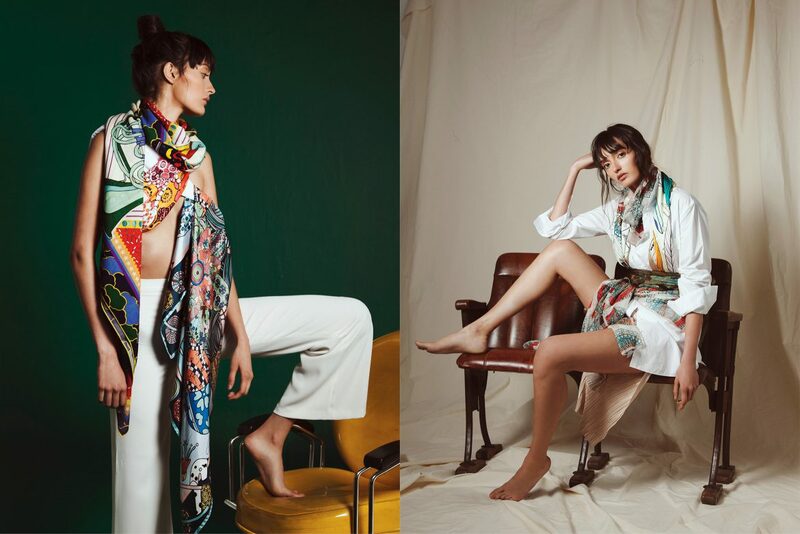 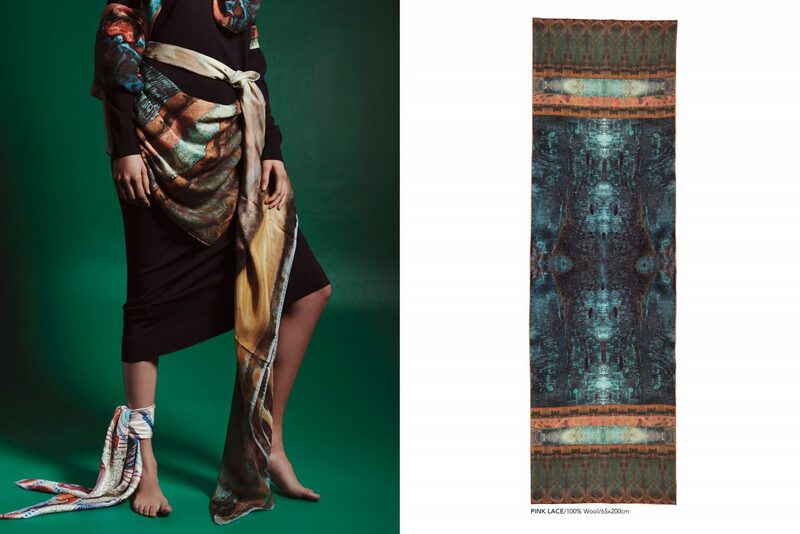 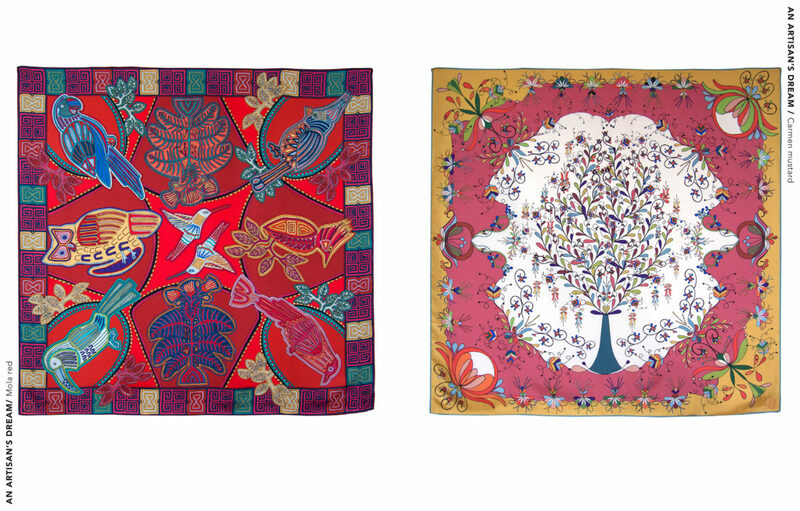 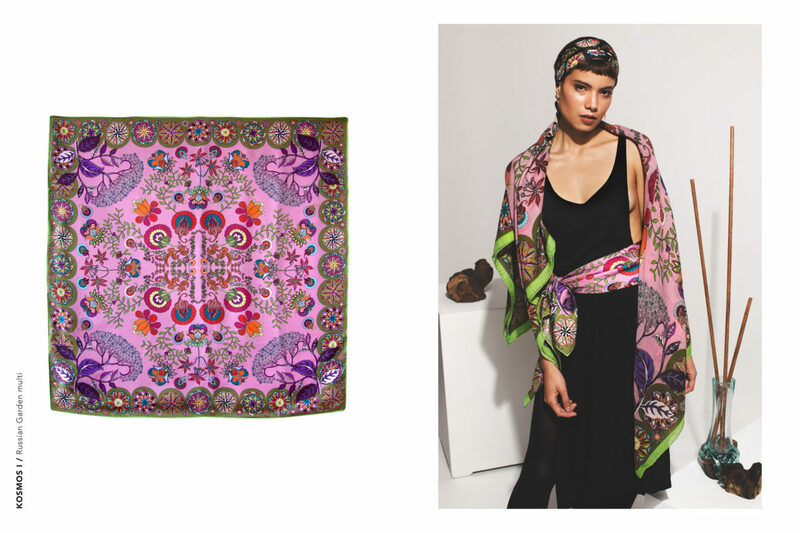 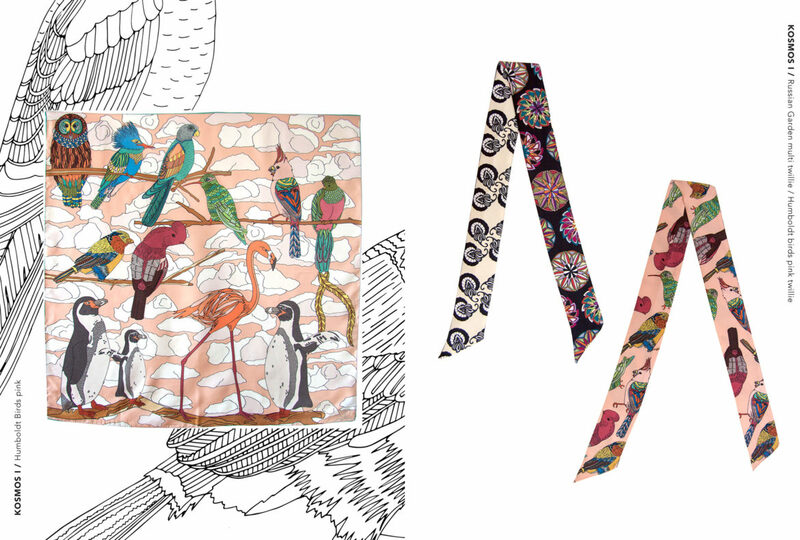 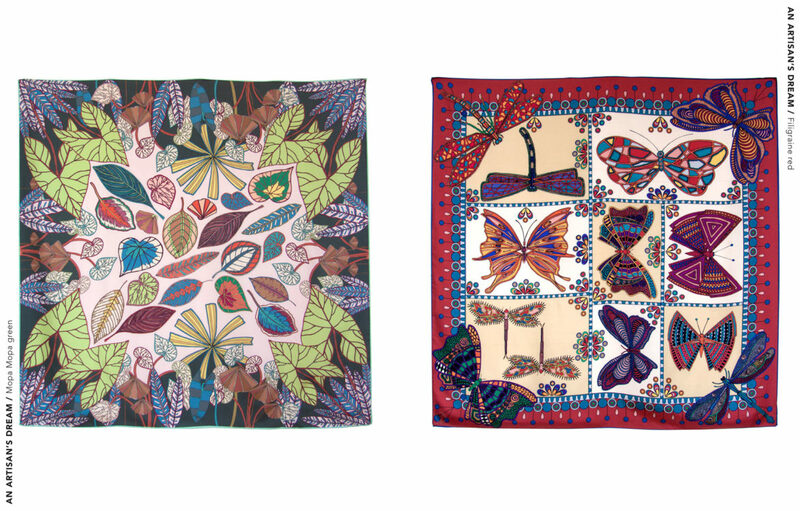 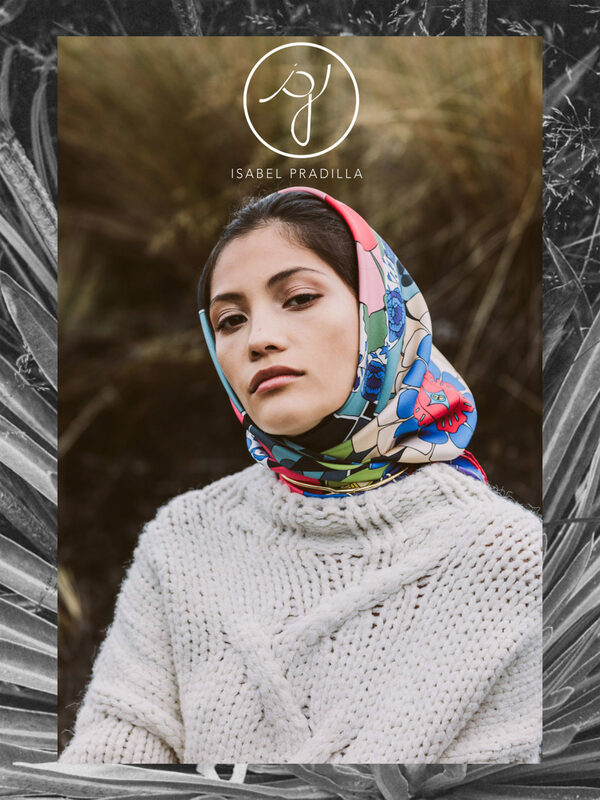 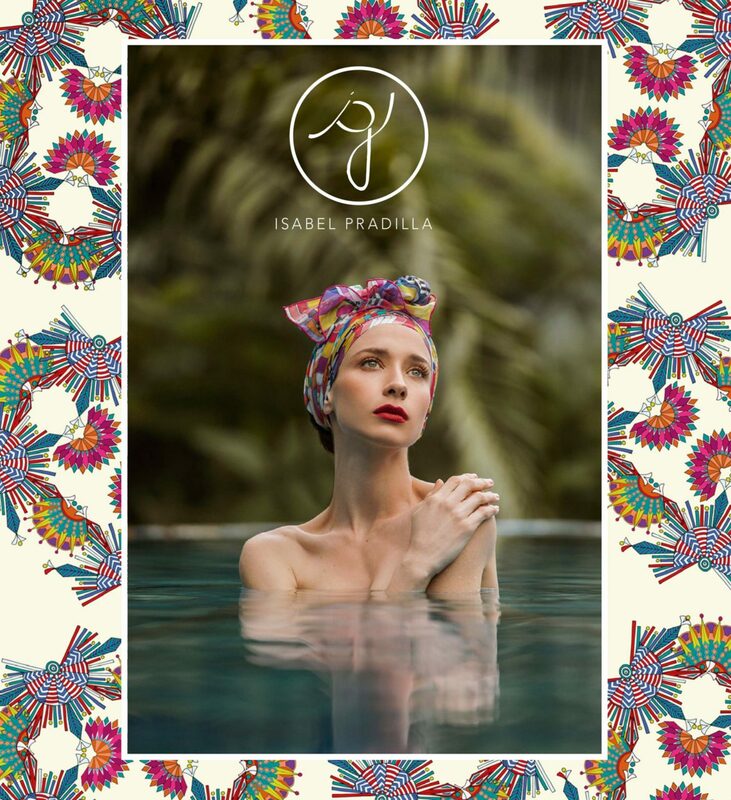 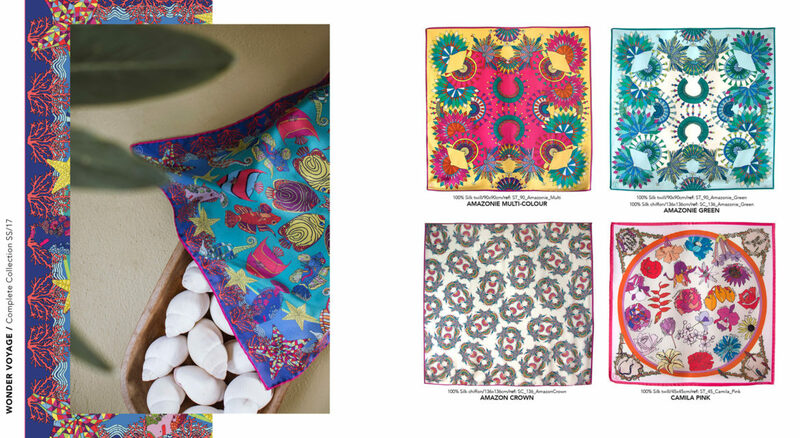 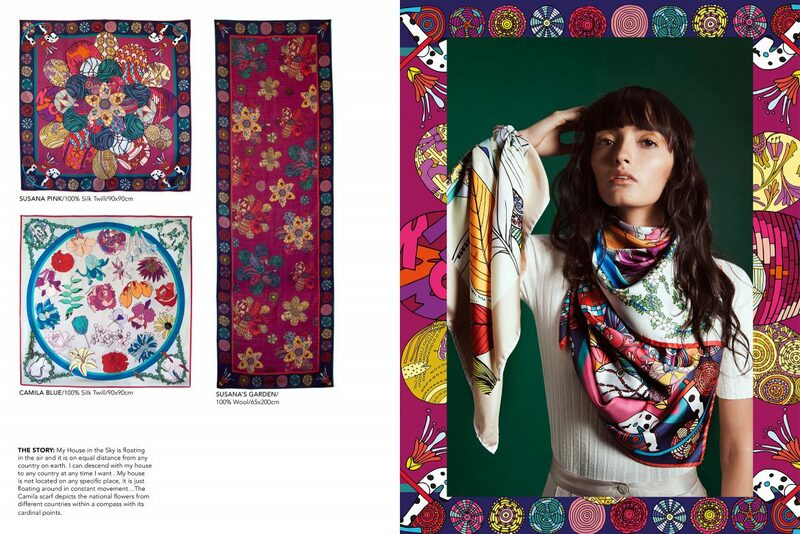 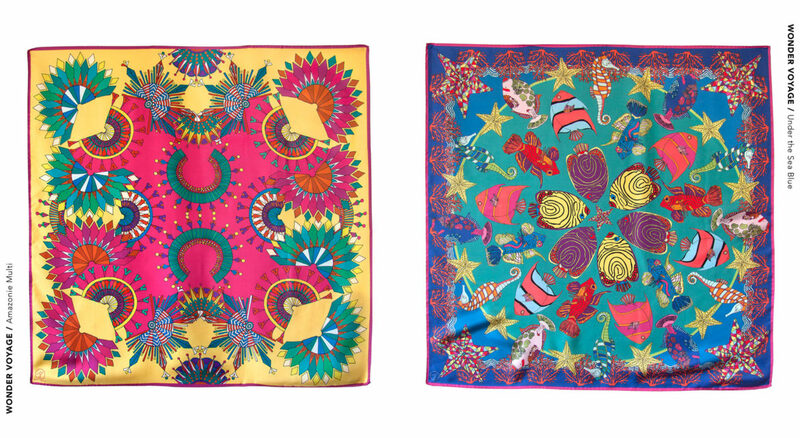 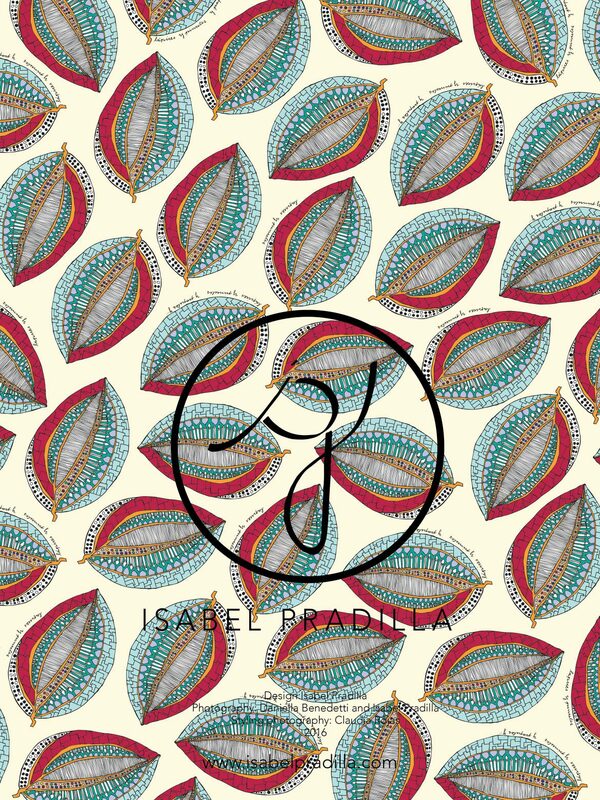 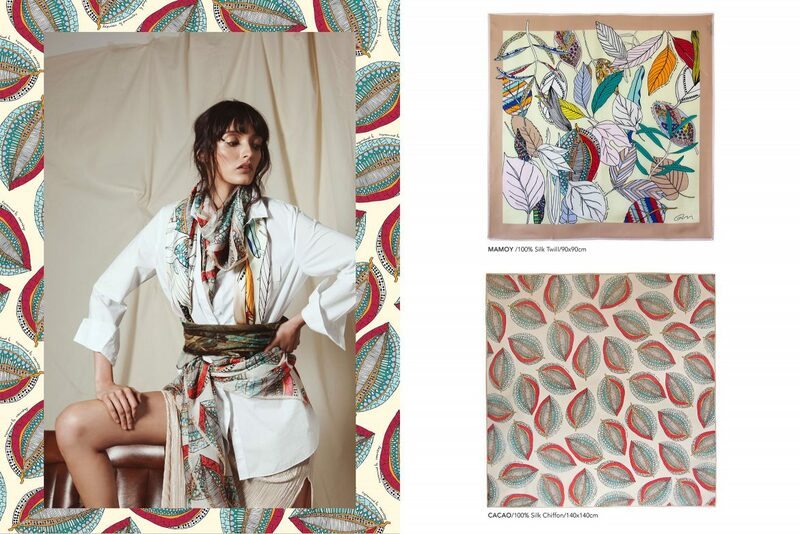 The colours and patterns created by this “magical” process where transferred onto this collection of digitally printed scarves. 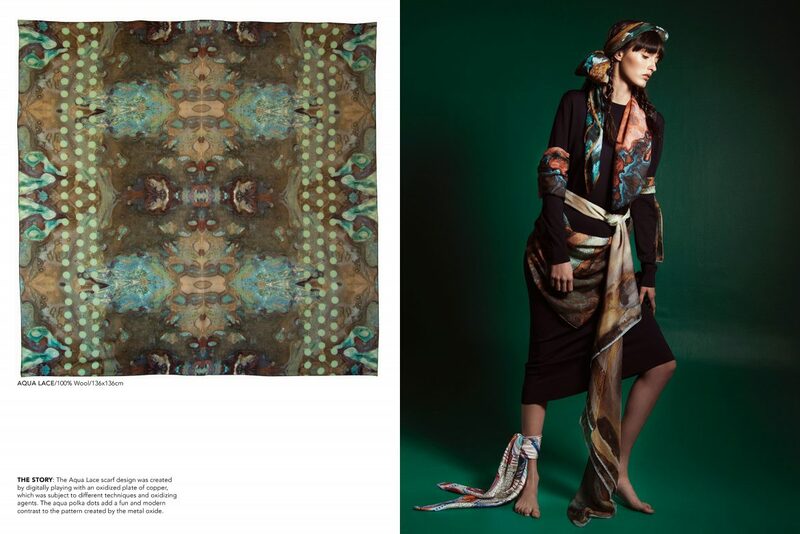 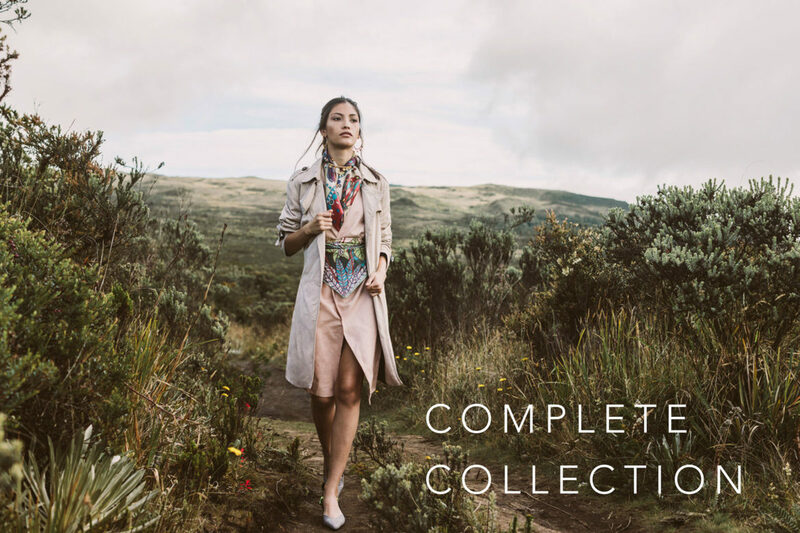 Each piece offers randomly created unique patterns and unexpected colour combinations.